Ever wonder how some of those commercial fly patterns you buy in stores get through the selection process before becoming viable mass-distributed products? 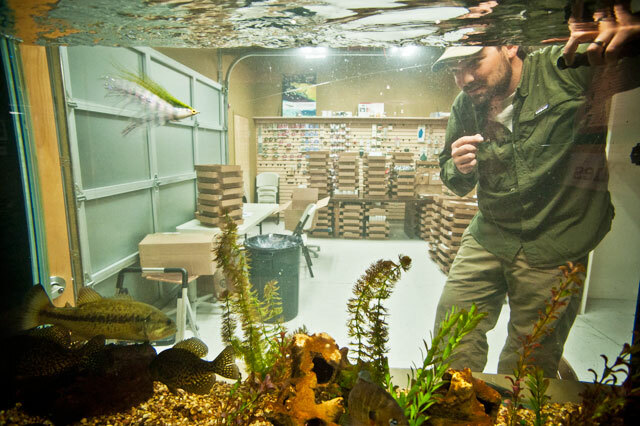 Well, the peeps over Umpqua Feather Merchants at one point in the elimination rounds literally swim them through their “little” on-site warm water aquarium (notice Mr. Bass in the lower left hand corner). When I say “little,” I mean that this thing constitutes almost a full wall at their distribution facility in Louisville, Colorado. They test for “swim-ability”— how realistic they look while in or on the water—and a multitude of other attributes before going on to further steps. Who would have thunk it, right? I wonder where they test the shark flies…?